Cardo's Pizza & Pasta has been serving the best food in town since we opened our doors. We make our menu selections with the freshest ingredients and bring it right to your door quickly, conveniently, and we have the farthest delivery range in all of circleville. 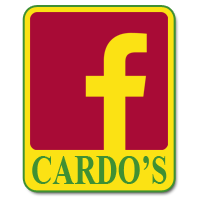 "If you like pizza, you'll love Cardo's!" We offer an amazing selection of gourmet pasta, fresh subs, top notch pizza, and a delicious selection of appetizers. We cater to almost every craving including wings, salads and our famous lasagna. Whether you would like to pay us a visit or want food brought hot and fresh to your door. Cardo's Pizza & Pasta will never fail to deliver.